Although Islamic finance has demonstrated impressive development over the last few decades, many critics continue to raise the issue of Islamic financial institutions’ (IFIs) reluctance to apply risk-sharing principles, especially mudarabah and musharakah contracts, in the kinds of financing they offer. The issue of high risk associated with mudarabah and musharakah remains an obstacle to implementing them. Scholars have suggested a number of measures to minimize the associated risks, for example, proper guidelines on negligence (taqsir) and transgression (ta'addi). 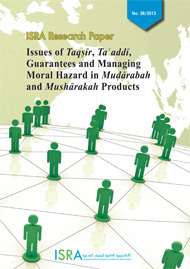 Hence a systematic investigation of the concepts of taqsir and ta'addi, guarantee (daman) and managing moral hazard in mudarabah and musharakah products is paramount to their implementation. Therefore, this study aims to discuss the essence of mudarabah and musharakah, which both contain the concepts of trust and profit sharing, and to examine the Shari'ah view on daman, taqsir and ta'addi in them. The basic principle in this regard is that the entrepreneur has to bear the consequences of the business loss when it is due to shortcoming or transgression on his part. The study investigates the extent to which the element of daman can be inserted to protect the capital providers or partners in a business venture. It also examines the Shari'ah view on the permissibility of offering collateral as a provision against taqsir and ta'addi in mudarabah and musharakah contracts. It also reviews the Shari'ah view on the legitimacy of placing the burden of proof on the entrepreneur that he/she has complied with all business requirements in a situation where the actual profit was below the expected profit. The study uses qualitative research approaches consisting of document analysis, interviews and observations. In the first phase of the research, the researchers conducted a literature survey of past studies related to the topic, especially on the issues of capital and the nature and implications of the contract (muqtada al-'aqd) in mudarabah and musharakah as well as the issues of daman, taqsir and ta'addi. At the end of the literature survey the researchers concluded that there are certain issues that do not require further deliberation, such as the view of jurists (fuqaha) on mudarabah and musharakah, and discussion of the evidence regarding the legality of mudarabah and musharakah, as many previous researchers have elaborated on them. However, after analyzing the literature, it was very clear that a few topics required further discussion such as the issues of muqtada al-'aqd in mudarabah and musharakah; types of actions that can be considered from an Islamic point of view to be taqsir or ta'addi; elements of security and guarantee that are permissible in mudarabah and musharakah as long as they do not change the essence of the contract; and placing the burden of proof on the mu?arib or musharik on the basis that it will not transform the mudarabah into a contract of liability (daman). The mudarabah and musharakah contracts are two kinds of partnership for commercial activities. Trust is a key element of both contracts. In mudarabah the fund owners agree to make over their funds to the fund manager for investment purposes, and in musharakah the partners agree to join their funds. Authorisation of agency (tawkil) is the main element of both contracts; the entrepreneur acts on behalf of the rabb al-mal, and each partner is authorised to act as an agent for the other when they personally conduct transactions for the musharakah venture. Detailed examination of these contracts reveals that scholars have identified several types of permissible mudarabah and musharakah contracts on the basis of the textual evidence and logical reasoning. The mudarabah contract raises major issues in modern applications because the nature of the contract requires the absence of a guarantee of the capital and profit, which means that it provides limited or no liability for the worker or the managing partner. The categorization of musharakah into shirkat almilk and shirkat al-'aqd is paramount in determining the permissibility of a guarantee as it is permitted to grant guarantee on the capital in shirkat al-milk and prohibited in shirkat al-'aqd. According to scholars, there are two main factors required to include any form of partnership in the category of shirkat al-milk. First, the partnership is absolutely on the subject matter; second, there is no agreement that they are jointly investing in it. In discussing the issue of daman, its general meaning is a financial liability derived from contract execution or a liability that has to be performed as a consequence of a non-contractual act, such as assault. daman may arise from the very nature of a contract; for example, the exchange of ownership in a sale contract obliges the seller to deliver the contracted item to the buyer when he has paid the price. daman may also arise by stipulation in a contract or from customary need such as the obligation on the seller to return the price paid in the event he is unable to deliver the purchased item. The study found that taqsir is translated literally as negligence and that the word tafri? has the same meaning and has been used interchangeably with taqsir. Both have been understood as carelessness, for any reason, that causes harm. Hence, there is clear relation between negligence and harm. It is also understood that among the manifestations of taqsir (negligence) are serious carelessness and nonobservance of the requirements of administration and the accurate flow of management for good and perfect governance. Ta'addi is literally translated as exceeding a limit, going beyond, etc. It is an act that should not be done by anyone. Therefore, it is an action that is disapproved of by the Shari'ah, or by an owner by way of verbal expression, or by the customary practice of the society. ta'addi covers all acts that cause harm and corruption. Examples include dishonesty, insincerity, fraud, forgery, stealing, and abuse of power for personal benefit. The difference between taqsir and ta'addi is that taqsir is a failure to do required acts whereas ta'addi means performing acts that go beyond the limits set for the person who performs them. Although some scholars who looked into the meaning of these terms considered taqsir to be a subset of ta'addi, this study inclines towards the distinction mentioned above. Scholars agreed that a few contracts such as 'ariyah, ijarah and wakalah bi al-ajr are in general trust-based contracts. When they decided that the entrusted person (fiduciary) should guarantee or uphold daman in a few cases, it does not mean that they transformed such contracts into guarantee-based contracts ('uqud al-damanah). The Shari'ah does not prohibit stipulating that a fiduciary should prove that he has not intentionally placed an item in a dangerous situation which has led to its loss. This finding is also supported by interviews with Shari'ah experts, who agreed that it is permissible to ask for proper disclosure. The quality of entrepreneurs is an integral concern raised by respondents involved in business activities. Therefore, the study concurs that any inability by a fiduciary to disclose the real facts may lead an independent party (either the court or an arbitrator) to issue a judgment against him. The need to protect people’s wealth (?if? amwal alnas) in an environment in which greed (?ama?) has become widespread is a major reason for allowing feasibility studies and other circumstantial evidence and customary practice to be treated as evidence in disputes arising from trust-based contracts. In case the actual results of an investment project fall short of the projections of the feasibility study the fiduciary party would be obliged to offer evidence to explain why the shortfall is not his/her fault. It is permissible to impose this requirement as long as it does not become a trick (?ilah) to consume riba or does not transform the contract into another kind of riba-sensitive contract. The interviews with the respondents, especially entrepreneurs, supported this stance as they are more cautious when they have to bear a certain amount of liability. It gives the capital provider the right to fair disclosure. In the event that the entrepreneur refuses to provide proper disclosure, the court or arbitrator has a right to use the collateral that has been pledged against negligent acts. Hence, the consequence of non-disclosure is not direct. The stipulation does not transform the contract into yad damanah. The stipulation is a means of verification and increased security for protecting both parties. It takes into account the reality of the low degree of religiosity in current society.